Anyone who has ever visited my parents' farm has seen the gray buildings sitting beyond the small orchard. 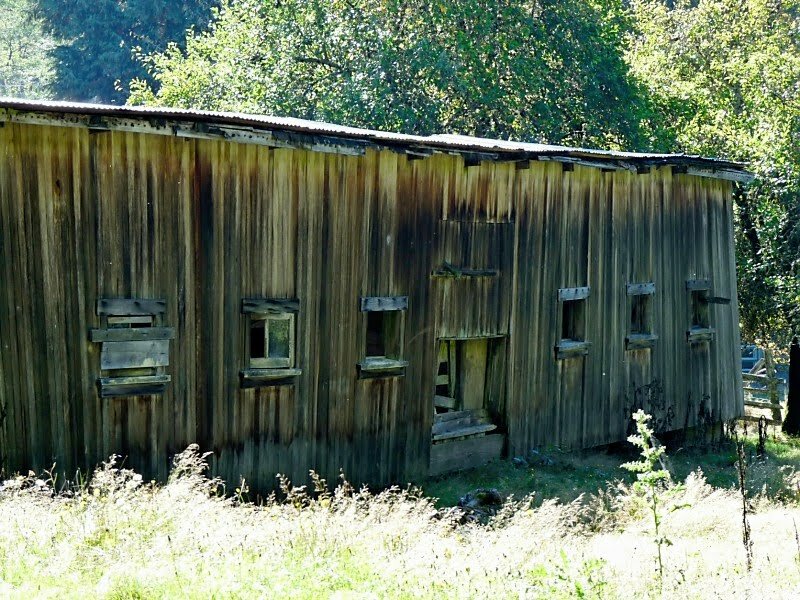 They were originally bunkhouses and could be put on the railroad tracks and moved from one logging camp to another. My grandfather bought them and moved them onto the farm, probably during the Great Depression, as I've been told he borrowed $600 at that time and set up a chickenhouse. When I was little, the buildings stood in a long row with a raised porch between them; the closest one to the house was a shop; the other was the chickenhouse. Years ago Dad pushed the chickenhouse sideways and turned it into an open shed. This picture is of the backside. 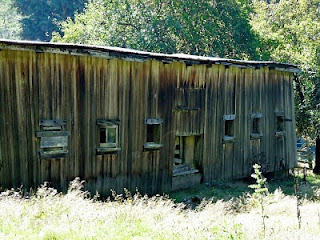 Anyway, I mention these outbuildings in the following poem and can't imagine that anyone would understand their significance to me without some explanation. that begin with pouring a cup of coffee. that opens to fields I know by heart. has to make room for it. than the sky / for the brain the sky contains." I think she meant "the mind" or maybe "the soul." like Whosoever Will in the old Sunday School lesson. resting atilt on their foundations, abandoned. vine maple, cedar, holly, douglas fir. this sense of how big my heart will have to be. The other family story about these buildings is that when one of my older aunts married (she was 17, I think) she and her husband for a short time lived in the shop. As a kid, I was fascinated with the whole idea of that. Where did they put the bed? There was a pot-bellied wood stove, and outside the front door a trough for cooling milk cans (they kept a few dairy cows then). I suppose, however, that they ate with the family in the house. Have I ever given you a copy of my poetry book -- The Coyotes and My Mom? If I haven't I'll send you one. I agree, some kind of genius. This poem has windows in it, "that can contain the sky." No, I have never seen your book The Coyotes and My Mom. Thank you. I look forward to getting it. "My heart unfolds like..." made my heart unfold. I love this. Thanks for sharing! Cerise -- there must be some synchronicity going on as I've been watching your blog, too.